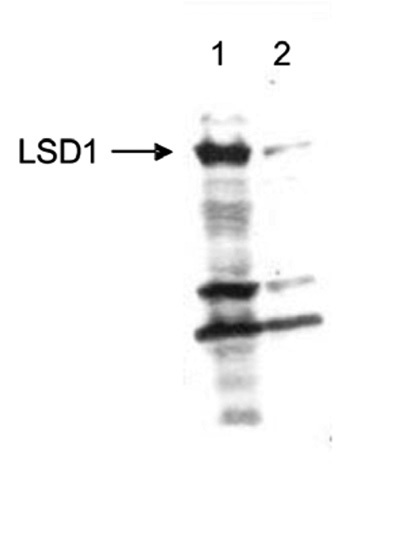 Add LSD1 polyclonal antibody - Classic to my shopping cart. Request a quote for a bulk order for LSD1 polyclonal antibody - Classic. Please fill out the form here below. Your local sales account manager will get in touch with you shortly and send you a quotation based on your requirements. Polyclonal antibody raised in rabbit against human LSD1 (Lysine-specific demethylase 1), using a KLH-conjugated synthetic peptide containing a sequence from the N-terminal part of the protein. 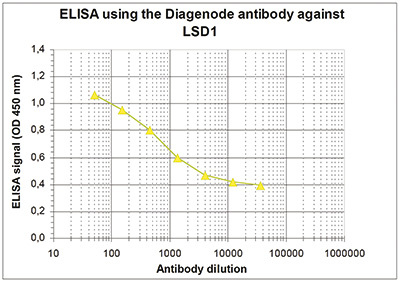 To determine the titer of the antibody, an ELISA was performed using a serial dilution of the Diagenode antibody directed against human LSD1 (Cat. No. pAb-125-050). The plates were coated with the peptide used for immunization of the rabbit. By plotting the absorbance against the antibody dilution (Figure 1), the titer of the antibody was estimated to be 1:2,500. Western blot was performed using respectively 150 μg (lane 1) or 50 μg (lane 2) nuclear extracts from HeLa cells and the Diagenode antibody against LSD1 (Cat. No. pAb-125-050) diluted 1:1,000. The location of the protein of interest is indicated on the left. 293T cells were transiently transfected with an expression vector for HA-tagged LSD1 (lanes 1) or with an empty vector (lanes 2). 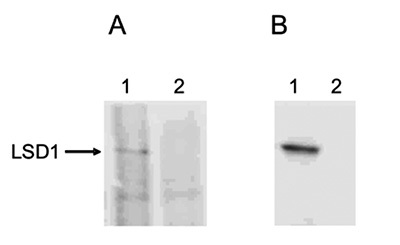 Figure 3A: Whole cell extracts were analysed by Western blot using the Diagenode antibody against human LSD1 (Cat. No. pAb-125-050), diluted 1:1,000. Figure 3B. Whole cell extracts were immunoprecipitated with 2 μg of the Diagenode antibody against LSD1. Immunoprecipitates were analysed by Western blot as described above. Diagenode strongly recommends using this:	LSD1 polyclonal antibody - Classic (Diagenode Cat# C15410125 Lot# A56-001 ). Click here to copy to clipboard.